If it's not broke... don't fix it! Consumers are losing literally millions a year because they're "Locked In". Don’t update your Printer Firmware or it could cost you. Manufacturers, such as Lexmark, HP, Brother and Canon use "Firmware" to control your printing supplies and options. The printer manufacturers, Lexmark, HP, Brother and Canon are continuing to modify the "Firmware" (Firmware controls the functions of a printer's features) you use to prevent you from choosing the origin and type of the supplies you use. Don't permit them from dictating what you purchase and how much you pay. Most Original Equipment Manufacturers (OEMs) suggest you to set your printer to download firmware updates and install them automatically. We at Priceless Ink & Toner suggest you to change the setting disallowing automatic updates. This will allow you to use our high quality compatible and remanufactured printer supplies and reduce your printing costs. Otherwise you will only be able to use the original (OEM) printer cartridges. Once the firmware has been updated it is not easy and also very time consuming to roll back to the older version that worked with the compatible and remanufactured printing cartridges. After all if you're happy with how your device is performing, there is usually little point in rushing to install the newer firmware that could cause you hours of problems or even calls to an expensive helpline. With these particular manufacturers, quite often, a new firmware upgrade can actually downgrade features and/or functionality. Specifically, firmware designed to limit or restrict the use of third party (aka aftermarket) consumables. That is fine, if you only use OEM brand printer cartridges in your device, firmware updates are unlikely to have any impact on you. However, if you prefer to have a choice and use third party compatibles or remanufactured ink and toner cartridges, it's probably best if you don't upgrade to any non-critical versions just yet. We at Priceless Ink & Toner had many customers with a previously fully functioning printer contact us to say they suddenly can't use any of our third party cartridges which, they have been using with complete satisfaction for years. The reason almost always is caused by a recently installed printer firmware update. Recently HP have been asking customers to 'lock' their genuine cartridges to protect against theft. Once the cartridges are locked, they cannot be used in any other printer. This has a knock on effect when the empty cartridge is made available to a re-manufacturer, as the printer information remains locked to the cartridge preventing any future use in a different printer. Read the information thoroughly before agreeing to any such update, as there will only be one person to blame, if you suddenly lose the ability to use that collection of cheaper print cartridges! You will know if this has happened when you get constant messages similar to "Cartridges locked to another printer", "Cartridges failed" or "Cartridges cannot be recognized". You've probably just gone past the point of no return! Drivers are installed on your PC to help the Printer and PC to communicate. These can usually be updated and rolled back to a previous version and do not have any impact on what you can and can't use in your printer. Firmware on the other hand, is installed directly to your printer and contains more permanent fixes and features. Manufacturers usually recommend the latest Firmware as it may provide significant enhancements to speed and functionality, although once installed, I'm afraid you're stuck with it until a newer version is released. Call Priceless for accurate advise on new printers and which are cost effective for your needs. The Federal Trade Commission's recent report, "Copier Data Security: A Guide for Businesses," makes a succinct, yet powerful, statement sure to get the attention of any organization: "Digital copiers are computers," and organizations should incorporate these devices into their information security plans. Digital copiers, also known as multi-function printers (MFPs – office machines that have the ability to print, scan, copy and fax) have hard drives, embedded firmware and the ability to communicate with other systems on the network. They are susceptible to the same security vulnerabilities that a computer is, and without the proper security measures in place, the MFP poses a significant risk of sensitive information exposure. Networked MFPs are now commonplace in the workplace environment, with office workers using them daily to print, scan and fax documents over the network; in many instances these documents contain sensitive information. To prevent damaging data breaches, government organizations must control and protect both the physical and electronic access points on their MFPs. The following are 10 specific steps that agencies must consider to secure MFPs, based on common scenarios that exist in most environments. 1. Require user authentication. There is no MFP more unsecure than one that allows anonymous usage; such devices are susceptible to various forms of abuse and can make tracing the source of a data breach or leak virtually impossible. Authentication enables the auditing, reporting and tracking of user activity as well as various other security features. 2. Restrict access based on user authorization. Just because a user has authenticated into the system, doesn't mean he should have access to every function. At the MFPs, restricting access ensures that users only have access to those resources on the network that they normally do. 3. Centrally audit all network activity. Compliance security standards require most organizations to implement procedures to regularly review records of information system activity, such as audit logs, access reports and security incident tracking reports. Centrally building an audit trail of all copy, print, scan, email and fax activity at every networked MFP will bring use of these devices into compliance. 4. Encrypt data to/from MFPs. In order to ensure data security, all data transmitted to and from an MFP should be encrypted. Government agencies must leverage encryption technology that meets specific security guidelines defined by Federal Information Processing Standard Publication 140-2. 5. Implement pull printing. In order to avoid exposing documents to risks when printed, secure printing requires that users authenticate at the device before documents are released. The device must print only those documents that are associated with the authenticated user, and the print job must not be stored on the device prior to printing. 6. Implement rules-based printing. Rules-based printing controls output by analyzing print jobs before release, based on a set of established rules, to determine how they are printed. Organizations with established print policies, such as the U.S. Army Directive 2013-26 "Armywide Management of Printing and Copying Devices" or the General Services Administration PrintWise program, can enforce these policies with the implementation of rules-based printing functionality. 7. Enforce trusted destinations. Once necessary measures have been taken to restrict access to network functions of an MFP through authentication and authorization controls, agencies must ensure the devices are configured to properly prevent documents from being scanned or faxed to any destinations that may risk sensitive data exposure. A common "high risk" scenario is a networked MFP that is configured for “scan-to-email” and outbound analog faxing without controls in place to validate the email address or fax number of the recipient. 8. Monitor and control PII activity. Most government organizations have policies in place to protect personally identifiable information (PII) and other sensitive content. For example, the Department of Homeland Security issued its "Handbook for Safeguarding Sensitive Personally Identifiable Information" outlining mandatory guidelines for all employees to follow to protect PII within and outside of the organization. Similarly, the Navy published a "Users Guide to PII" containing compliance requirements and protective measures to safeguard Navy and Marine Corps. Agencies should leverage software to systematically enforce the PII policies they have enacted. Without a solution in place, organizations must rely on employees manually following protocol, leaving no room for user error. 9. Standardize and integrate network scanning. One common problem with traditionally configured office MFPs is that no two devices within an organization are setup the same way for document scanning. In a typical scenario, each MFP is manually mapped to a network file share with no standardization throughout the organization. Through standardization, administrators can centrally control network folder scanning with a single configuration. Also important is integration support for all of the major commercial off-the-shelf document systems to enable direct and secure scanning. 10. 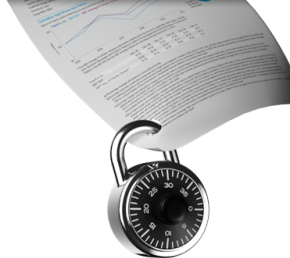 Securing print processes. To prevent damaging data breaches, government organizations must control and protect both the physical and electronic access points on their MFPs. The penalties, settlements and costs for failing to safeguard sensitive information are increasing, and there are simply too many touch points that create risk in sharing information. Most of these involve the technologies that organizations are counting on – especially networked MFPs that copy, print, scan, fax and email. Agencies must act to enable the compliant exchange of sensitive information and PII by adding a layer of security and control to paper-based and electronic processes. They need an approach that transparently applies automated security techniques – which cannot be circumvented – that authenticate users, control access to workflows, encrypt data, validate network destinations, monitor and control all documents containing PII and build and maintain an audit trail of all user activity. By adopting this approach, government organizations can minimize the manual work and decisions that introduce human error, mitigate the risk of non-compliance and help avoid the damaging costs of sensitive data exposure. Visit Priceless Ink & Toner for your printer supplies. The technology, which removes toner from paper, has received over 778k US dollars in investment. Cambridge News reported on Cambridge University "spin-out" company Reduse, which has created the 'unprinter' technology, receiving $778,500 in investment from Cambridge Enterprise, the university's commercialization arm, as well as Cambridge Enterprise Fund III, bringing its total investment fund to nearly $1.5 million. The technology removes printed text and images from paper, "allowing it to be reused". The technology uses lasers to "remove print from laser-printed and photocopied paper", which can be repeated "several times without damaging the fibers of the paper". Reduse believes that this can reduce "a business' paper costs by as much as 40%", with the average office employee using 10,000 sheets of paper a year and discarding around 80% of this within "a few days". The system works with both "standard laserjet and copy machine toner", Reduse added. Hidde-Jan Lemestra, CEO and Co-founder of Reduse, stated: "It is our goal to allow the reuse of paper, eliminating the need for recycling. Cambridge Enterprise and Park Walk Advisors, which manages the University of Cambridge Enterprise Fund III, share this vision and are important partners as we continue to develop this technology." "Over the course of the coming months, we will be working on prototype development and further engagement with customers while continuing our conversations with some of the biggest printer manufacturers in the world." Mike Arnott, Cambridge Enterprise Investment Manager, is set to join the Reduse Board of Directors, and added: "We have been observing Reduse make impressive progress in their pre-funding stage. With such an enormous opportunity and a strong team, we're looking forward to working with them." Stuart Evans, Chairman and Co-founder of Reduse, commented: "Unprinting is a unique, intuitive solution to a global problem. With a lot of interest from a very diverse customer base, I believe we are on the right track to developing something that will change the way we think about using paper." Still, to be able to unprint, you need to print first. So when you run out of toner, visit priceless-inkjet.com and resupply. Brother released a technical white paper in which it advises both remanufacturers and chip manufacturers how to "properly program the data field" on aftermarket chips. The white paper is titled Technical white paper: Aftermarket chips for Brother inkjet printers, and follows in the footsteps of a similar production from HP in 2013, in that it aims to help remanufacturers avoid conflicts with aftermarket chips. The OEM states that it has recently launched inkjet printers that "contain a new cartridge authentication function", which provides customers with a message "stating whether the ink cartridge installed is a Brother-branded ink cartridge" manufactured by the OEM, or a "non-Brother ink cartridge manufactured by others". These include the MFC-J680DW, J880DW and J885DW, which utilize the LC201 and LC203 cartridges. The message shown on the printer's display would either say "Genuine Brother supply" or "Non-Brother supply", but the authentication message "will not be accurate unless the chip manufacturer has properly programmed the data field on the chip". The OEM states that "if you are a supplier of ink cartridges, please instruct your chip manufacturer to follow the instructions in order to allow accurate display of the cartridge authentication message and avoid causing confusion" for users. Chip manufacturers are asked to "please follow and comply with the instructions", and not to "attempt to use any programs to circumvent this cartridge function". The authentication software has been developed to "properly inform" users that they are using either a Brother or non-Brother cartridge, but some cartridges had "misidentified themselves" as genuine, and the OEM believes the new software will "provide better transparency to customers to make an informed choice", which will "be beneficial to everyone concerned in the ink cartridge market". The programming and identification recommended "will not result in any loss to features or quality in printing", Brother adds, as third-party suppliers can "properly identify" their products to "demonstrate to your customers that your products are respectful of registered trademarks". Its instructions discuss programming the data field on chips "correctly" for the new machines, with manufacturers told to change string ASCII characters to "some other value" from Brother. A third-party manufacturer's "own brand identifiers" are recommended instead, and the next step is to change "Field X" after the ASCII characters to "0x01', as only "0x00" should be used for genuine Brother cartridges. The OEM warns that "putting any value other than Brother as ASCII characters", and putting "0x01" in the field, will "only change the display message that the customer sees". Other than the printers already listed, Brother states that inkjet machines with 2.7-inch or larger displays launched this summer "are expected to have this authentication messaging function". Concluding that the white paper "may be updated in the future", the OEM states that with more machines being released that will contain the software, remanufacturers and chip manufacturers are asked to "properly and consistently program the existing chips of your cartridges by following the instructions".